What are the biggest expenses for Irish households? The roof over our heads, the food in our belly and the means of getting from A to B top the list. Groceries are a big expense for the average Irish household. IF YOURS IS ONE OF the three-quarters of Irish households that budget for expenses, then you will probably know exactly where your money goes each month. Don’t worry if not though, it is never too late to start. The most recent data from the Central Statistics Office dates from 2010 and it shows the average expenditure of an Irish household where the primary earner is in the 25-44 age bracket is just under €900 per week. That figure is likely to be higher now*, especially when taking spiralling rents into account. Unsurprisingly, housing is the biggest outgoing for this cohort, accounting for almost a quarter of all household expenditure. The average countrywide monthly mortgage repayment for first-time buyers right now is €918 (according to the Banking and Payments Federation of Ireland), while Daft.ie puts the national average weekly rent at €259.25. But your housing expenditure doesn’t stop there. Water charges, refuse costs and the price of any maintenance that needs to be carried out, all fall under this heading too. After housing, food is where the bulk of our money goes. It accounts for about 15% of all expenditure and, in 2010 at least, that equated to roughly €130 per week. The average price of a basket of groceries is more expensive now however, with figures from Kantar Worldpanel in Ireland showing a 2.7% increase in September 2016, compared to the same time last year. Delving a little deeper into food costs, the CSO finds that uncooked meat and fish is the category where most of the money goes, secondly it’s fresh fruit and veg and thirdly, items that come under the milk, yogurt, cheese, butter, oil heading. A Behaviour & Attitudes poll on behalf of the Competition and Consumer Protection Commission last year, found that 75% of people make a household budget and more than half of those surveyed said the recession had taught them how to manage their finances better, with many looking out for better value far more often than they have in the past. Supermarket share figures in recent years have reflected that increased quest for better value by Irish consumers. The latest data from Kantar, shows Lidl now has an almost 12% market share, with sales up 4.5% in the last quarter, and customers returning more often. Aldi commands a similar market share at 11.4%, up slightly on last year. 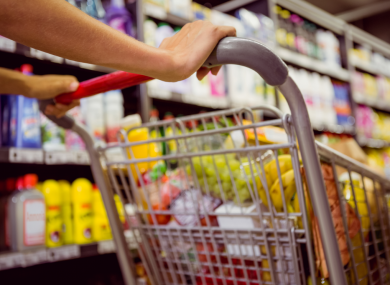 However the Kantar survey also found that shoppers’ average spend has increased, suggesting that more people are now being tempted to put luxury items into their trolleys. Takeaway is the fourth biggest category of food expenditure for Irish households according to the CSO. Research by JustEat.ie last year, found that those aged 25-34 order takeaway most often, spending an average of €56.33 per month. Urban dwellers account for 55% of the market, spending more on takeaway food than the national average. After we have filled our bellies, the third biggest drain on our finances is transport. It accounts for about 15% of all weekly household expenditure, with fuel taking the largest proportion of the cost, followed by public transport, parking, and vehicle tax and insurance. Do you know your durables from your non-durables? Just under 6% of our money goes on what are termed household durables and non-durables – that is, garden furniture and washing machines vs detergents and toilet paper – followed by clothing/footwear at 4.9%. The CSO data shows that women outspend men 2:1 on the latter. Keeping the lights on and the house warm accounts for 4% of household expenditure, with a similar figure for alcohol/tobacco. In 2010, those in the 25-44 age group spent an average of €14.44 per week on drinking outside the home and €10.52 on drinking at home, while the weekly tobacco bill was €13.00. The remaining weekly expenditure is categorised as miscellaneous, which includes items as diverse as pensions (which take up the bulk), medical costs, TV/Internet subscriptions, childcare, betting/lotteries and charitable donations. How do you fare when it comes to household expenditure? Does most of your money go on housing, food and transport? *The CSO told TheJournal.ie that it is in the process of compiling the next Household Budget Survey which is the source for these figures. It is due to be published next year. Email “What are the biggest expenses for Irish households?”. Feedback on “What are the biggest expenses for Irish households?”.